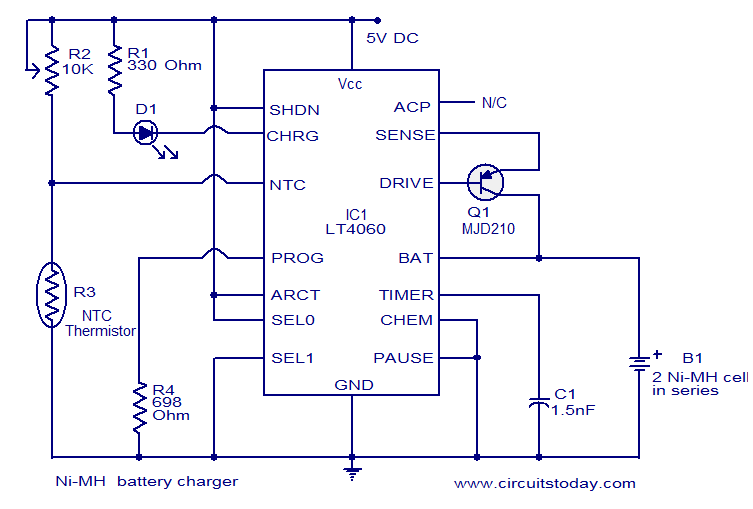 This is the circuit diagram of a very powerful and efficient Ni-MH battery charger using IC LT4060 from Linear Technologies. In addition to Ni-MH batteries Ni-Cd batteries can be also charged by slightly modifying the circuit.For charging Ni-Cd batteries connect the CHEM pin (pin12) of the IC to +Vcc.Here the circuit is configured to charge 2 cells connected in series. By altering the connections of SEL0 and SEL1 pins, upto 4 batteries in series can be charged using this circuit. For charging aÂ single cell, connect SEL0 and SEL1 pins to GND. For charging two cells, connect SEL1 to GND and SEL0 to Vcc. For chargingÂ three cells,Â connect SEL1 to VCC and SEL0 to GND. For charging 4 cells, connect SEL0 and SEL1 pins to VCC. The circuit also features temperature based charge qualification.An NTC thermistor connected at the NTC pin (pin11) of the IC serves as the temperature sensor. Preset R2 must be set around 4K. Type no of Q1 is not very critical. Any 3 to 5A PNP transistor will do the purpose. LED D1 serves asÂ a charge indicator. can i charge 12v NI-MH battery pack using it? Hi No this cannot be used as the supply itself is only 5volts. This IC can handle between 4.5 to 10 volt only. can you plz tell me, is there any charger circuit to charge 12v NI-MH battery pack. Hi Rohit you require an external ballast, you can use a 20 watt flurescent light ballast for this lamp as it has got its own built in starter. electronic balast for 2 pin 11watts available but i have not seen any for other rating in the market. I added a image of the CFL light, as you can see it does not have a driver or a ballast attached, hence iam requesting your help. Hi Rohit you donot require any ballast for these CFLs as they are with built in electronic switching supply to take care of 170 to 270 volts AC. Can you help me with a circuit diagram for a 26 watt CFL, single pins (only two pins on the 26 watt CFL). I picked up some CFL’s and I found i cannot find ballast in india for these. thank you sir SEETHARAMAN. I’m searching for the circuit of 20w flourescent lamp electronic ballast. hoping for your reply. soon! what ic can be substitute for LT4060? I NEED REPLY SOON!